“The Spanish team just went that way! Hurry!” exclaimed our lift operator as we got off the chairlift today. People have caught Olympic fever and the mountain is finally alive with skiers. Some of them may have planned to attend the Men’s Downhill race — or, in my case, cover the race for the press — but they were happy to enjoy the fresh powder on the slopes. Although the rain at the bottom has forced a delay for both the ladies training run and the Mens Downhill, most of the mountain is enjoying plenty of fresh new snow. We didn’t catch up with the Spaniards. They were out of who were out of sight before we could get our pole straps on, but we did follow a pack of Finnish snowboarders, wearing jackets with sleek, off-center Finnish flags. We also realized we need to put some small Finnish flags on our poles. I guess we’ve caught the Olympic spirit too! The Olympics Opening Ceremonies are almost over. They have set right a day that could have gone sideways. A Georgian lugist died in a training run. By now the death of 21-year-old Nodar Kumaritashvili — who was thrown out of his sled near the bottom of his run, whipped into a metal beam and then slammed onto the ground — is not news. But the way that the Vancouver organizers have dealt with it has been impressive. They did not cancel the press conference already planned for today. Instead, they devoted the event to today’s tragedy, taking the opportunity to express their sympathy for the athlete and his family, and for the people of Georgia. It was the right thing to do. As we listened the press conference at the alpine center, the room fell silent. When it was over, we all continued to stare at the screen. All afternoon we wondered what this would mean. The Georgian Minister of Sport and Culture gave a press conference later. He reminded the journalists that Georgia was invaded by Russia in 2008, yet Georgia still participated in the Beijing Olympics. Of course, the Georgians will compete and the games will go on. The Minister said Kumaritashvili was a talented and ambitious athlete, and that his country was mourning the loss. He said the Georgians would let the investigation into the accident take its course. Also the right thing to do. Tonight the Georgians remembered Kumaritashvili with black arm bands and a black band on their flag. They received a standing ovation. Prior to officially opening the games the chairman of the IOC president Jack Rogge stopped to express sympathy again to everyone affected by today’s death. And, finally, a moment of silence was observed in the stadium and Kumaritashvili’s face was shown on the screen. And the show went on, and what a show it was. Vancouver and Canada can be proud. They properly honored the memory of a young man whose Olympic dreams were stolen away, but still created the celebration of multi-nationalism and sport that the Olympics are meant to be. Last night I was one of 50,000 volunteers at the dress rehearsal for the Olympic Opening Ceremonies. I won’t give away any details, not after producer David Atkins (also of the Sidney 2000 ceremonies) pleaded with us not to reveal this beautiful gift that will be lovingly presented tomorrow to Vancouver, to Canada, to The World. OK, you can forgive him the hyperbole. He’s clearly been working hard. It’s no Beijing, but the show is pretty cool. Why then is the Olympic Broadcasting Service (OBS) showing clips of it today? I’m sitting in the alpine press center and, in between Lindsey Vonn’s husband doing interviews, a US skier getting heli-vac’d out and training runs getting canceled (again), I’m watching clips of Aboriginals dancing and Irish fiddlers. Like I said, not giving anything away: the OBS was showing the clips. And it’s not like the reporters covering one of the most dangerous sports in the Olympics are going to pay much attention to feathered headgear and tartan kilts. Feathers and kilts… Hmmm… not that compelling. I guess they really are saving the good stuff for tomorrow. Especially that phallic part. My mind’s not in the gutter. It was unmistakeable. Maybe it’ll look different on TV…. we’ll have to wait and see. The past two days I’d reserved for skiing, and what skiing it was. The snow coverage is excellent, but slopes are empty. It was almost eerie to have entire swaths of mountainside all to myself. Whistler’s hotel rooms and condo units are occupied by spectators and athlete support staff, very few of whom are skiing. The only folks on skis tend to be the occasional local and clusters of pole-less smurfs. Smurfs are Olympic volunteers. Once you see their blue jackets, you’ll understand. The pole-less skiing smurfs have the sweetest job, as far as I can tell. They’re the men and women who slip, slide and simply caress the ladies and mens downhill courses and, whenever they have a break, hit the slopes on Whistler Mountain in boisterous, pole-less packs. At the end of the day they have beers at Creekside. Then they do it again the next day. Nice. From what I saw during my visit to the alpine press area today, my co-workers in the Olympic News Service are not quite so laid back. They’re working 12-hour days already, and the races haven’t even started. Stories they’ve filed include a profile of the many countries the skiers hail from this year (Cayman Islands, Pakistan, Brazil… let’s just say it’s a record) and the old high-low stories, as in youngest (16), tallest, most decorated, etc. The exotic country and oldest skier stories came together in the 52-year-old slalom skier from Peru. Yes, 52 and competing in the Olympics. Back to the slopes, today I did spot a few athletes and their support staff from various countries. The skiers whizzing by at death-defying speeds, in perfect slalom form, were out of sight before I could determine their nationality. 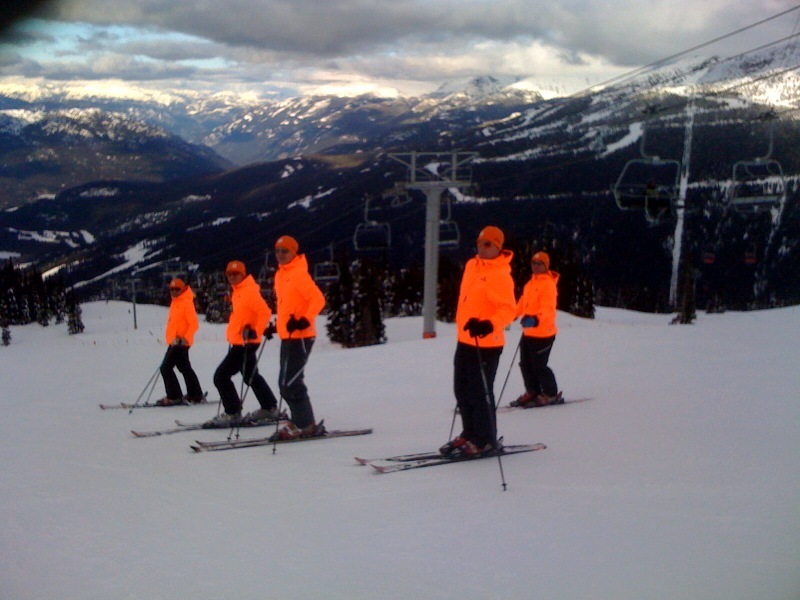 But some of the non-alpine skiers were easier to spot… especially these Orange Juliuses in the attached photo. I chased them down and asked where they were from. Holland, of course. We arrived in Whistler and went to the accreditation center. A young woman who had also traveled on the bus wearing a red “Luge Canada” jacket said her boyfriend is on the team (does that make him a “lugian”?). The coast guard from New York asked if her boyfriend had a big scar across his jaw. No, but she mentioned the name of another Canadian, um, lugian. That’s the guy, said the coast guard; he’d stitched him up at last’s year’s world cup when he came to him with a big flap of skin hanging off his face. Inside the accreditation center, things seemed impressively orderly, with multi-colored tape on the floor indicating where to go. But supplies were running low… When I tried on a volunteer uniform the pants slid right off. The vest armholes ran half-way down my rib cage. And the jacket? To my knees. I froze. Why the secrecy? And how could I meet her in “Accreditation”? Wasn’t the whole process “Accreditation”? She silently mouthed, “By the front door.” Got it. Brazenly, I ignored the map of colored tape on the floor and cut back to the reception area. Soon enough, the dark-haired manager emerged with a blue tote back; in it was a complete volunteer uniform in women’s small. In hushed tones she said that tempers were running high in the uniform area, with one woman insisting that she get a size small. But the manager said she was saving the few smalls she had left for the really small. In equally hushed tones, I thanked her for the bag of precious clothing and hurried out. I’ve decided to keep you all in the loop on my Olympic experience with a daily (roughly) update. Olympic excitement began before even landing in Canada. Our plane was full of Olympians. Since the flight was only 2/3 full, that means a big percentage of the passengers were among the best athletes in the world. The flight attendants were beside themselves: it was, “Ladies and gentlemen, we wish you a good flight – and especially to the Olympians we have on board today. We wish you all a great flight.” Two more times during the flight the flight she extended a special welcome and good luck to the skiers, ski jumpers and ice skaters on board. The front closet usually reserved for first class passengers was stuffed with fat black garment bags holding evidently irreplaceable ski jumping suits. Two ski jumpers, who as one might expect were medium-height and lanky, sat across the aisle from me. Someone who looked like a coach was in front. Walking to immigration a 6’2″ buff Nordic-type (Nordic as in blond hair; not as in cross-country skiing) was making a deal with the 5′ stylish Asian girl next to him: he’d try a 360 on ice skates (actually I think he said he could pull that off already) if she would try skiing. He also said many of his Canadian friends dated ice skaters… was he suggesting a multi-sport romance? The minute you land it’s all Olympics. The airport is loaded with volunteers clad head to toe in that unfortunate, but easily recognizable, bright baby blue hue of the volunteer uniform. I asked a few of them if they were having fun yet (how fun can standing at an airport giving info to hapless travelers be?) and the answer was an unequivocal yes! It’s the excitement of being part of such a big event. Ostensibly the Vacouver 2010 organizers deliberately eschewed flashy, pompous style in favor of efficiency. They wanted to be the greenest Olympics yet, and Canadians aren’t the flashy type anyway. The Olympics have so far come in on time and on budget; and even the pesky problem of global warming bringing 50 degree F weather and rain to Cypress Mountain (a local resort just outside Vancouver where the snowboarding and freestyle skiing events will be held) has been dealt with by laying down straw and helicoptering in pristine white snow from higher elevations. Canada wants to show the world it can pull off the Olympics without a hitch. They would also like a gold medal, something that has eluded them in the two previous Olympics they’ve hosted. The spectacular crash last November of the downhill skiing world champion John Kucera – who did a double summersault before snapping his tibia and getting helicoptered to a hospital to have a metal bar put in his leg – was a crushing blow to a Canadian alpine (downhill, not cross-country, skiing) team that has by now lost 6 skiers to injury this season. Fortunately a Whistler local, Manuel Osborne-Paradis (Manny) has a good chance of earning a medal in the Men’s Downhill, which will be the opening medal event of the Winter Games. Even if he doesn’t get gold, having the Canadian flag on the podium for a silver or bronze would be a nice start for Canada. I’m on the bus from the Vancouver airport to Whistler. The sky is steel gray and the water is reflecting the low lying clouds. The view is nonetheless breathtaking, and locals must be proud that the rest of the world will soon grasp what a special place this is. My fellow bus travelers include a US coast guard officer currently stationed in NY who was granted paid vacation to volunteer as a medical assistant for the sliding (bobsleigh, luge and skeleton) events; a 50-something year old from Calgary who is a passionate cross-country skier and is thrilled to be stationed on the field at the biathlon events; and a young chef from Alberta (but born on Vancouver Island) who will be a paid bus driver in Whistler. His dad signed up to drive buses and urged his son to come help, as more drivers were needed. He said Whistler is so crazy already that they’re actually gathering the Whistler drivers in Squamish. Housing is so short some are even staying in homes for the elderly! Maybe I’ll see him driving the bus I’ll be taking to my shifts every day.